My latest post is all about the Benjamins, baby, and for those of you who are getting bored of staring at their same old hundred dollar bills – good news! There’s a new hundo in town. Benjamin Franklin is finally getting the facelift he deserves! 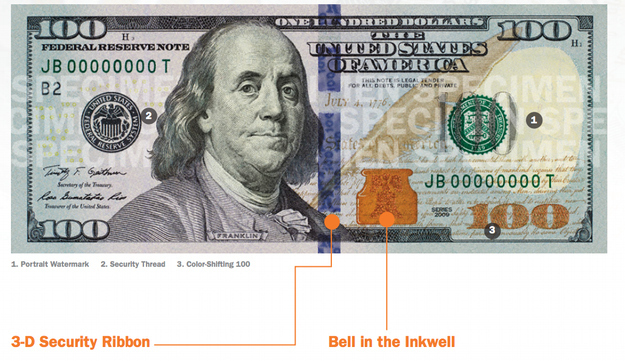 These freshly designed $100 bills started making their way into circulation yesterday, and although they might not appear to be all that radically different from our old bills, these new Benji’s have a ton of sophisticated anti-counterfeiting technology going on under the hood. The feel of the bill is texturally different. For the first time, the engraving process includes the effect of “raised printing.” This “can be felt throughout the $100 note, and gives genuine U.S. currency its distinctive texture,” a government website on the design changes says. 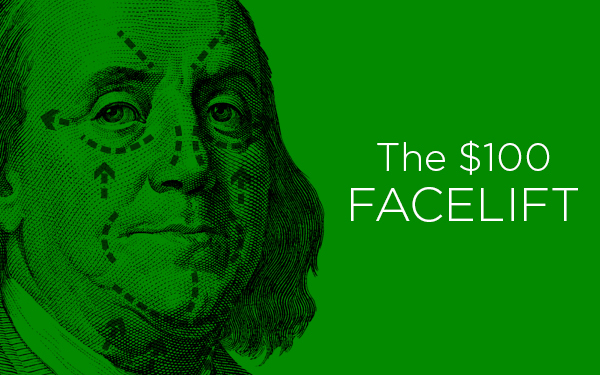 On the note, around the left shoulder of Benjamin Franklin is where you can detect the raised printing the most. This form of printing on the bill is supposed to make it harder for counterfeiters to copy and easier for the public – and store cashiers – to authenticate. There’s a new blue security ribbon to the left of Franklin’s head. No, surprisingly this is not a printing goof. It’s actually designed as another security feature for the bill. If you tilt the paper, the designs along the strip change from Liberty Bells to the number “100” in moving patterns. Something neat about this is that the ribbon has nothing to do with the actual printing, instead it’s woven onto the paper. A shiny new copper-colored bell is in the inkwell icon.  This new icon is rendered in another non-green hue, a copper-colored inkwell. When the bill is tilted back and fourth, the bell shifts from copper to green – which makes yet another security feature for the bill. A quill pen appears above the inkwell to represent the Founding Fathers signing the Declaration of Independence. Probably the most notable change is a large gold 100 that’s featured on the back. The large 100 on the back of the bill is meant to help those with visual impairment and easily read the denomination. Other new features on the new bill include a security thread that when held to the light you’ll see an embedded thread that runs vertically on the bill. The thread is imprinted with the letters USA and 100. The new note is also printed on special paper which includes red and blue security fibers, and is one-fourth linen and three fourths cotton. 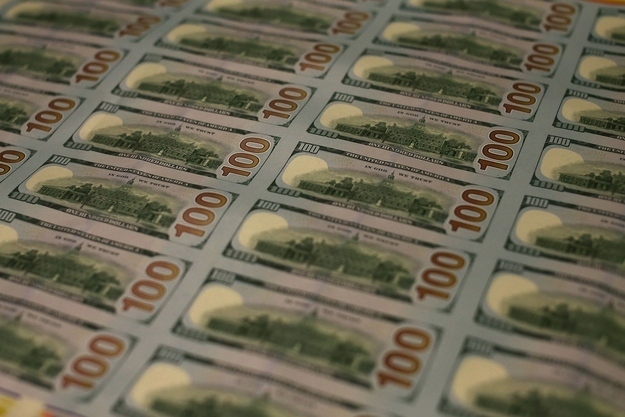 The new bills will only be printed in two locations, Washington, D.C. and Fort Worth, Texas. You can tell where the bill was printed because if it has a small F.W. in the top left corner it was printed in Fort Worth, if it has no indicator it was printed in D.C.
From a design standpoint, the bill seems quite cluttered with verbiage, images, and a new thick blue line running down the center that isn’t so attractive to the eye. But with all currency, security trumps design, and this new design is all about stopping potential counterfeiters in their tracks. What do YOU think about the new bill design and the high-tech security features?